Today (July 1st, 2010) a law prohibiting the possession, sale and distribution of shark fins goes into effect in the state of Hawaii. Hailed as a victory, albeit a small one, by conservationists, this law nevertheless is a major step in recognizing the need for government action to help save the shark. Sought after by the Chinese for millennia shark fins were a delicacy reserved for the elite, and served at important celebrations and banquets. With the recent rise of the middle class in China the demand for shark fins has skyrocketed. This Chinese fondness for shark fins is threatening their survival. Although laws banning consumption of shark fins is a positive step in limiting the shark fin trade we, as consumers, must also consciously make a choice not to eat shark fins if we are to succeed in preventing the shark’s extinction. A study in 2006, conducted by fisheries scientist Shelley Clarke, estimated that as many as 73 million sharks are killed every year for their fins. Mary O’Malley of Shark Savers, a shark conservation awareness group, said, “The growing consumption of shark fins has caused relentless overfishing of sharks, and many populations have plummeted by 90% or more in recent years as a result.” Many species of sharks worldwide face extinction. The shark fin trade is an ancient practice according to Andrew Coe. Writing in his book Chop Suey Coe describes how 19th century European, and later American, traders brought shark fins to China from the warm waters of Indian Ocean and Southeast Asia to trade for tea and china. It was one of the most lucrative items in the China trade of the period. In order to supply today’s huge demand sharks are caught solely for their fins. After hacking off the fins in a practice known as “shark finning,” their bodies are dumped back into the ocean, where many still alive and unable to swim sink to the ocean floor. They eventually die from starvation, suffocation or are eaten. This cruel and inhumane practice must be outlawed. Thanks to many conservation campaigns the public has been made much more aware of the precariousness of shark population and the cruelty of shark finning. More and more people from around the world are making a decision to stop eating shark fin soup. In Hong Kong couples no longer serve shark fins soup at weddings and employees are demanding their companies stop serving it at corporate functions. I urge everyone to join in the movement to stop consuming shark fins and start opting for alternative ingredients. 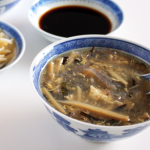 Let me show you how you can reproduce a delicious soup that is in every way as delectable as one that contains real shark fins. Texture is the key to enjoyment of shark fin soup. An excellent ingredient for imitating the flavorless and crunchy jell like texture of shark fins is konnyaku, which is a Japanese yam flour cake. In Chinese it is known as moyu doufu (魔芋豆腐). 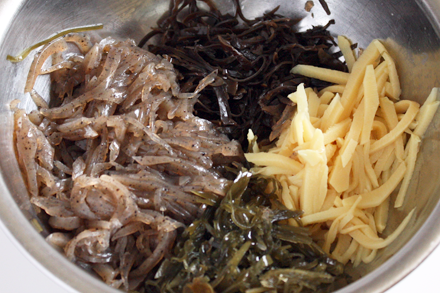 You can find commercially produced konnyaku noodles in thin strands sold as vegetarian shark fins. It is also available as a cake, which is what I use in my recipe. The key is to make sure the konnyaku cake is julienned as thinly as possible to resemble the shark fins. To enhance the seafood flavor I use the type with seaweed powder mixed in. If you prefer a non-vegetarian version you can replace the vegetarian stock with a stock of chicken and ham for a more authentic taste. 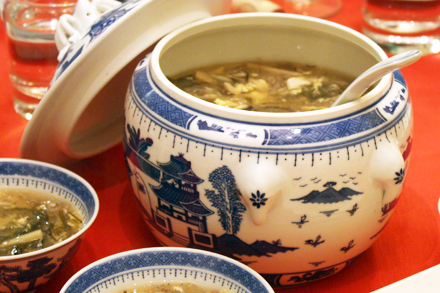 Make the stock using chicken bones and a hunk of ham flavored with Chinese cooking wine, ginger and scallion. I guarantee you will not miss the real shark fins with this alternative. “By taking this strong action to ban shark fins, Hawaii has made an enormous contribution, not only to the survival of threatened shark populations, but to the health of our oceans, our planet and the consumers.” said O’Malley. Try my recipe and save a shark today. Prepare the vegetarian stock according to the recipe in my previous post. 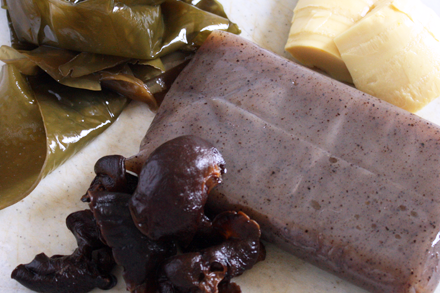 Reconstitute both the wood ear mushrooms and the kelp in warm water for about 15 minutes. In the meantime julienne the konnyaku cake and the bamboo shoots into very fine shreds. Set aside. Julienne both the wood ear mushrooms and the kelp in very fine shreds as well. Be sure to cut the kelp against the grain. Set aside. Clip both ends of the mung bean sprouts and keep only the crunchy white part. 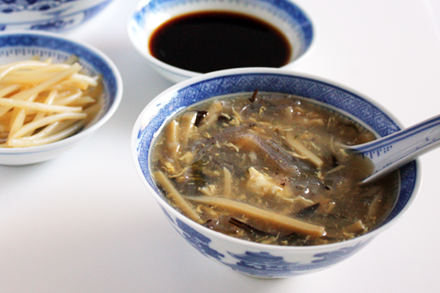 Known as “silver sprout” or yin ya (銀芽), these sprouts regularly accompany shark fin soup. Blanch them in boiling water for just about a minute. Drain and set aside. After straining the vegetarian stock, bring the liquid to a boil in a large pot. Add all the ingredients for the soup except the egg and cornstarch slurry. Simmer the soup for about 20 minutes then add the cornstarch slurry and continue to cook until the broth thickens. Beat the egg in a bowl. Swirl the egg into the soup and keep cooking for another minute or two, or until the egg is completely cooked. Serve the soup piping hot with silver sprouts and Chinkiang black vinegar. Thanks for the recipe and for sharing those links! I have recently started becoming more aware of shark finning after watching the documentary Shark Water (www.sharkwater.com). The documentary comes off a little self-centred at times (the filmmaker talks a lot about his personal experience as a shark activist), but it does offer some interesting insight into the industry. This is great! Hopefully more chefs start doing the mock soup! Thanks for the wonderful Vegetarian Shark Fin recipe. I’ll definitely give it a try. Could you suggest a place where I can get konnyaku? Hi Yi, Konnyaku is available in Japanese, Korean and some Chinese stores. They come in clear plastic bags packed with water. You should be ashamed of yourselves for promoting shark fin soup. Shark finning is cruel and tasteless. What’s the matter with you people.. They say ignorance is bliss, I think its an excuse. Either you did not read the post or you were too angry about shark finning. I’m glad that at least we have one thing in common. That is we both do not wish to promote the consumption of shark fins. Thanks for the wonderful recipe. I am crazy with Shark fin soup until I heard how cruel it is, and its process with indiscriminable chemicals that are harmful. The konnyaku does come in packages alreday sliced! Could you please compare the difference between using konnyaku and glass vermicelli which I have seen in other mock shark’s fin soup recipes? Hi Lucy, Thanks for your comment. Bean Vermicelli is made from mung bean starch and physically resembles shark fins. But the texture is soft and does not withstand cooking for a longer period. Konnyaku is very chewy and gelatinous just like real shark fins. It can also withstand longer cooking time allowing flavors to be absorbed. Making it superior in imitating shark fins. I was able to recreate this soup thanks to a trip to the Ocean Pacific grocery in Denver, CO. and the very kind assistance of their staff. I wasn’t able to find the yam cake with seaweed powder, so I substituted sea lettuce which has a pronounced seafood flavor & aroma. I was able to get 4 generous servings from the recipe at a cost of less than $2 per serving. I understand the original costs somewhere in the neighborhood of $100 and no animal was harmed by my effort. Thank you so much for your concern for the poor shark and this wonderful recipe.